The Gemini is beautifully landscaped. The Cedar Point Gemini is the fifth oldest coaster at this popular amusement park, but it continues to thrill millions of riders year after year. 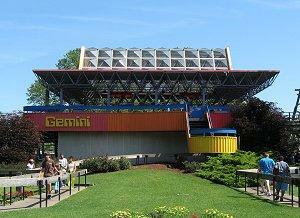 If you are planning a theme park getaway to Cedar Point amusement park, be sure the Gemini is on your must-ride list. Built in 1978 by Arrow Dynamics for an initial cost of $3.4 million, the Gemini is a rare hybrid roller coaster design. The coaster's structure is made up of 500,000 board feet of strong Douglas fir that covers nearly six acres of the park, but because roller coasters are classified based on the type of track they use, the Gemini's tubular steel rails make it a steel roller coaster. 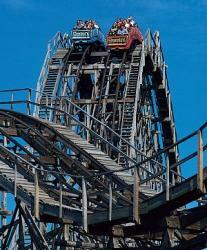 Another rare characteristic of the Gemini is that it is a twin racing coaster, one of very few remaining in the world. Red and blue trains vie for the winning position but unlike many modern coasters where the "winner" is predetermined, the winning train on the Gemini is decided by the weight of each train and when the cars are dispatched from the two independent operating centers. At one time, up to six trains may be running on the Gemini at once, giving it one of the park's highest ride capacities at nearly 3,300 riders per hour. Many experienced riders will agree that the best ride on the Gemini is one where both the red and blue trains are filled and racing. Unfortunately, because of the coaster's design and age, trains must be carefully balanced to avoid stalling on hills or rolling back into valleys along the ride's course, and this means it does not always race. On days when crowds are lighter, as well as early and late in the day, only one side of the coaster may be running. Visiting on crowded days or choosing midday rides makes riders more likely to have an enthusiastic group of racers to share a lap on the Gemini with. Like all of Cedar Point's roller coasters, the Gemini will not operate in poor weather or storms, and its wheels may seize up in very cold weather, which could cause delays. 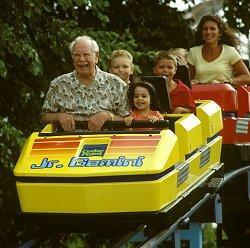 Riders must be at least 48 inches tall to experience the Gemini. Furthermore, because of the coaster's sudden dips and strong turns, it is not recommended for individuals who are pregnant or who may have heart, back, or neck trouble. Gemini is also not recommended for individuals who experience motion sickness, and its "head chopper" structure may be too intense for individuals with claustrophobia. Young riders who aren't quite ready for a ride on the Cedar Point Gemini can test their coaster nerves on the classic ride's smaller cousin, the Junior Gemini. Located across the midway in a small children's area and near the entrance to Camp Snoopy, the steel Junior Gemini is a mild coaster designed for the park's youngest guests. With a height of 19 feet and a top speed of 6 miles per hour, this small coaster is a thrilling choice for young guests who want to ride the Gemini but just aren't up for it quite yet. For very nervous youngsters, the Junior Gemini can accommodate adults in special seats so parents can reassure their novice coaster fans. The Cedar Point Gemini is one of the park's most popular roller coasters and has thrilled guests ever since it debuted as the tallest, fastest, and steepest roller coaster on the planet. While there are other Cedar Point roller coasters that eclipse the Gemini today, it is still a fun ride and well worth a race for any coaster fan.